Customize your own entertainment, with the power of Smart TV. The 40-inch Samsung UN40D6500 LED TV lets you go further into a world of entertainment - by customizing your own. Samsung Smart TV delivers a web-enabled portal to the best of the entire internet, along with Samsung apps and the ability to search content both online and on your TV. The journey continues with advanced 3D technology, for an immersive experience with your favorite 3D movie titles and TV programming. Ironically, you?ll make these deeper connections on a TV that?s impressively thin: the ultra slim bezel lets your eyes disappear into the dazzling LED images onscreen. 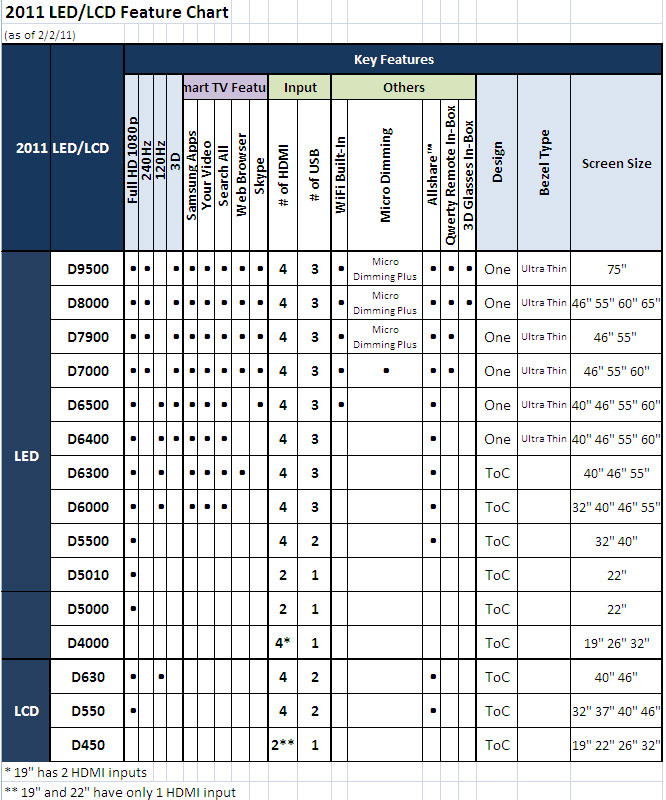 40' Class (40.0 Diagonal) LED HDTV with 1080p resolution. TV without stand: 36.7" x 21.6" x 1.2"
TV with stand: 36.7" x 23.9" x 10.0"